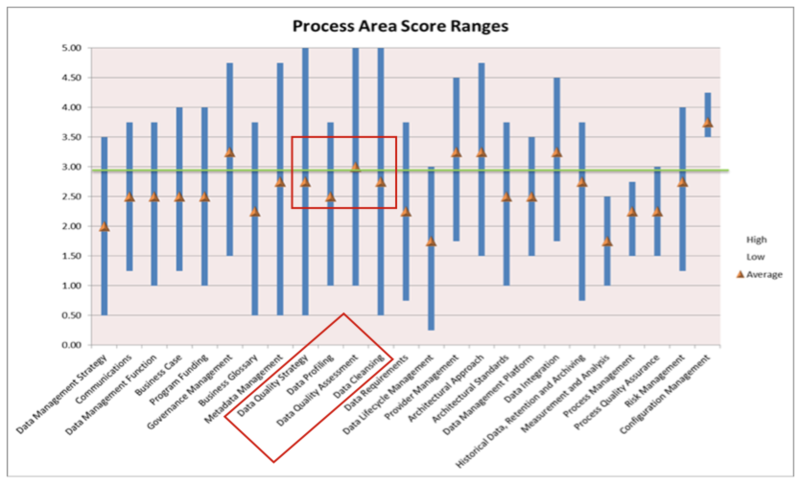 In our last column, Comparative Data Management Part 3, we explored two Data Management Maturity (DMM SM) Model data management processes with the highest average scores on our benchmark range chart. These processes were Governance Management and Provider Management. Then, we saw examples of organizational and implementation factors that reflect robust capabilities, which propel the organization towards optimizing its data assets and gaining the most value from them. In Part 4, we will focus on one broad topic – Data Quality – and share observations and examples from both lower and higher-performing organizations, with practical suggestions for how to accelerate and implement a data quality program. Before we turn our attention to the individual process areas, let’s consider the big picture. If you listed all of the components within the scope of Enterprise Data Management (EDM), including business, technical and solution-oriented (some respective examples – Business Glossary, Data Design, Master Data Management); I would state that you can capture the “Essence of Everything” in three broad groupings: Architecture = WHAT data assets are built; Governance = HOW the data assets are managed; and Quality = WHY you build, acquire, and manage data assets, namely, to put the data to meaningful use. Quality is the ultimate reason for implementing EDM, although this often goes unstated because it is thought that it should be obvious to everybody. But too often, it is not. According to the mission, purpose, and business processes needed to be the organization that it is – with the strategic objectives it has, in the industry in which it exists – an organization creates and acquires data, stores it, modifies it, uses it for operational decisions and actions, integrates it, and aggregates, models, and analyzes it to make tactical and strategic decisions. Better data leads to better decisions and predictions, greater staff efficiency, increased agility, and competitive advantage. While this a commonly stated principle, even a cliché in our industry, the reality is that at the enterprise level, there is little recognition of its importance, and few organizations demonstrate a clear understanding of the true impact of bad data on their business. Fewer still have made a top-down commitment to an organized set of processes and work products, resourced sufficiently to constitute a data quality program or formalized permanent quality function that eventually benefits all major business processes and the entire organization. Instead, enlightened business sponsors and responsible IT project managers discover and apply data quality practices in their own realm of control, usually at the project level. And there it typically stays, without expansion or extension to other projects, other business lines, or the enterprise. This is reminiscent of a block of upscale urban townhouses where amazingly, only a few doorsteps are kept free from trash, leaves, and dust. ‘Neglected’ is the best word to describe the condition of data in many organizations. You recall the picture to the right from Part 3, representing the Buddhist view of the journey of humanity from illusion to enlightenment. 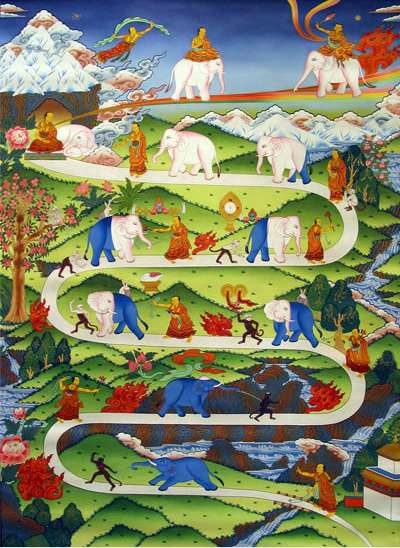 This presents a confusing picture – the same organization has varying capabilities in isolated areas, and there is no central backbone (in this picture, undoubtedly the Four Noble Truths and the Eight-fold Path) or plan to benefit from the separate achievements. The Data Management Maturity Model’s four Data Quality process areas represent a complete set of activities and practices that address the four major components of a well-organized approach to improving data quality. Achievement of DMM Level 3 in these process areas is evidence that the policies, processes, standards, and guidelines have been established, are understood, and are followed by all relevant stakeholders across the organization. Let’s take a look. Creating a strategy to launch, build, and maintain a data quality program is the quickest way to consider and encompass the vision of how the business will benefit. I mean ‘vision’ literally – what are the accomplishments the organization could achieve if data quality was improved? To take an insurance example, ‘If the property data didn’t have so many errors, like a Built Year of 2065, and a Construction Type Code value of Unknown, I could better estimate our risk and needed reserves, lower premiums, and increase sales.’ Business leaders across the organization have similar aspirations. Capture them. Discuss and agree on the capabilities that are available (the DMM is very helpful here) and those that aren’t yet implemented – e.g., we don’t have a data quality tool, we don’t have documented processes for profiling, etc. To create a successful strategy, you need to engage business representatives at all stages. If the organization never undertakes planning for data quality at the enterprise level, quality will remain uneven and costs will continue to be a burden (aka, ‘If you don’t get it, you don’t get it.’) Finally, this should all be completed in no more than three months, tops – if you drag it out, you won’t gain the momentum you need to launch. Note that the low score here is really, really low, 0.50 on a 5-point scale. 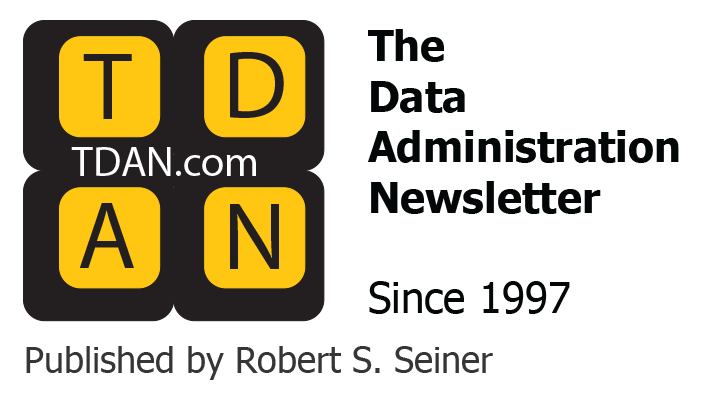 There are organizations which have never given much thought to what they can do to improve data quality, relying on data heroes and manual reconciliation to make the data usable. The average score of 2.75 shows that most organizations have implemented data quality at the program or line of business level and begun to standardize or centralize some functions and processes. The high score of 5.00 was earned by two organizations which had devoted considerable time, effort, and resources to planning and executing data quality improvements for many years and now enjoy the fruits of exemplary data quality. 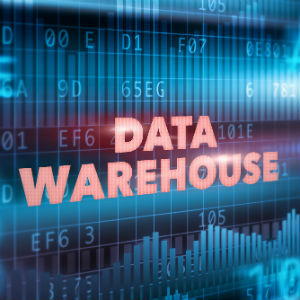 Data profiling has been conducted for application data stores for many years at most organizations, however, typically this is performed in an ad hoc manner, for example, a project team responding to a specific business complaint about data errors. Profiling as a cornerstone of an effective data quality improvement program is not often encountered, yet it is critical, since ‘you don’t know what you don’t know.’ Without profiling, the organization may not discover that there are nulls in important columns, such as a status code; there may be bad addresses or missing zip codes in customer data; or there may be surprise values in key code fields, such that research is required to see if the source system was modified or the value has not been documented. The causes and resulting effects are legion, like the grains of sand on a beach. Create a standard data profiling process – when to profile, how to request profiling, who performs the profiling, who is responsible for analyzing the results, governance involvement, etc. Create a profiling results report template – how summary results should be formatted, what conclusion types will be included, how detailed results will be linked or referenced, how technical and business impacts will be classified, how recommendations will be reported to business users, etc. Develop a brief course on data profiling aimed at business data experts – why profile, what support is needed from them, etc. The low score of 1.00 indicates that data profiling has not progressed beyond the ad hoc phase. Methods are not documented, custom queries are employed exclusively, results are not reported in a standard manner, etc. The average score of 2.5 shows that most organizations have understood the importance of profiling activities and are employing it across more areas of the organization, yielding greater benefits to more internal business customers. The high score of 3.75 indicates that an organization has implemented an enterprise-level standard process, standard methods, tools, and techniques, has engaged governance and business approvals for profiling and results recommendations, and likely has implemented centralized data quality services for critical and enterprise data. Data quality assessment is a systematic, business-driven approach to measure and evaluate data quality employing data quality dimensions, to ensure fitness for purpose and establish targets and thresholds for quality. The business owns the data it creates and manages. No organizations IT group can single-handedly improve the quality of data. Business representatives across the lifecycle of any given data set must be engaged to determine the data’s fitness for purpose, define the level of quality desired and the level of quality that is acceptable. To take an example of fitness for purpose, an organization may discover, based on data profiling results, that it does not capture a sufficient set of attributes to maximize the efficacy of its record matching algorithm; the data set is not fit for purpose because it is incomplete for preventing and reconciling duplicates. This conclusion may drive modifications to the data store(s) and lead to additional business rules. The most effective mechanism to assist the business in assessing data quality and establishing useful targets, thresholds, and metrics is the consideration and application of data quality dimensions to each attribute. A “dimension” is a criterion against which data quality is measured. A number of different dimensions of quality can be measured, and the DMM offers a sample set of dimensions against which to determine the data’s condition. Characterize the impacts of identified data quality defects or anomalies – e.g. risk, productivity, compliance, etc. Define a standard process capturing the above activities, and share it with the working groups undertaking assessments of other data sets. 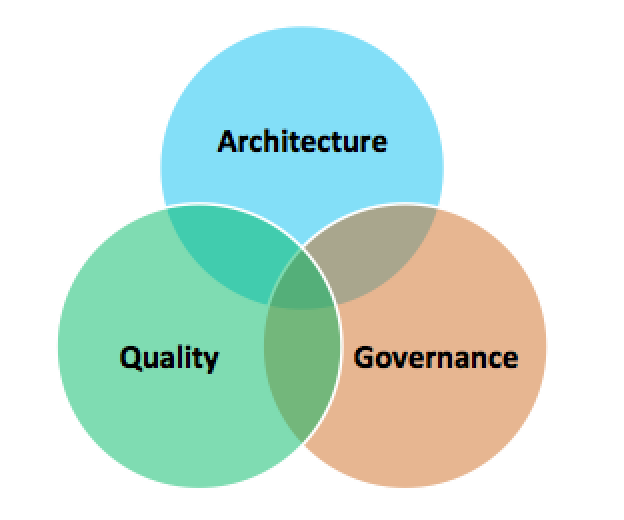 The score of 1.00 illustrates that an organization has not engaged the business in data quality responsibilities beyond the project level, is not employing data quality dimensions, and hasn’t implemented effective governance. The average score of 3.0 shows that some organizations have taken data quality seriously and have implemented processes and assigned responsibilities across the major business lines with significant business engagement. The high score of 5.00 demonstrates organizations in which the principles, processes, and practices of quality are deeply embedded, and the business is driving quality improvements. Data cleansing identifies the mechanisms, processes, and methods used to validate and correct data defects according to predefined quality rules, as well as the analysis and enhancement of business processes to prevent errors. Data cleansing focuses on data correction to meet business criteria (targets and thresholds) as determined by data quality rules addressing all applicable quality dimensions. Quality rules, developed through data quality assessment and the results of data profiling efforts, provide a baseline for identifying data defects which can affect business operations. 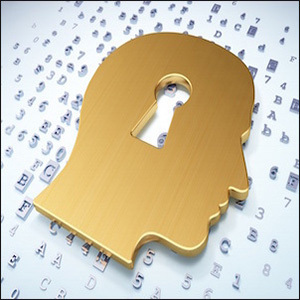 Gaps in business processes may be addressed to create better data at the point of origin or modification. Data cleansing activities are most effective when conducted at, or as close as possible to, the point of first capture, i.e. 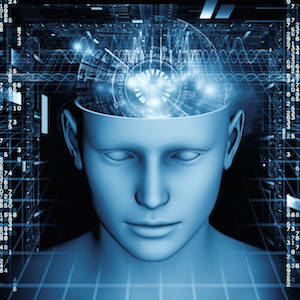 the first automated data store to record data, or as close to the original creation point as feasible. 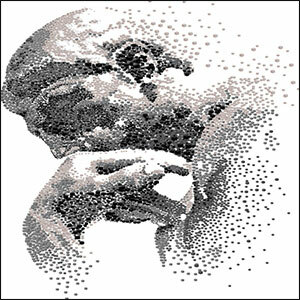 A best practice is to undertake cleansing activities based on data profiling and/or data quality assessment analysis. In this process area, the low score of 0.50 implies that cleansing methods have not been specified for even one project, and that the business users have not been involved. The average score of 2.75 shows that the organization has implemented a standard cleansing process for at least one program and is working to extend these efficiency gains to other business lines. The high score of 5.00 illustrates that the organizations data is well governed, that maximum effectiveness has been achieved, and that defects and anomalies are discovered, corrected, and root cause analysis and improvements are conducted as they arise, creating trust in the data across the organization. As mentioned, there are many detailed considerations, activities, and work products involved in addressing data quality as an enterprise imperative. The data quality strategy is the critical element to gain support and approval of the data quality program, making an enterprise approach possible and yielding steady improvements in quality over time. The results are worth the effort. By the way, ‘data’ is a mass noun, like ‘water’ or ‘tea’ or ‘advice’– the term ‘datum’ as a singular with the plural ‘data’ originated in the academic scientific world (first recorded in 1946) and is archaic in a modern context. “Data are” is incorrect business usage.